Steve Raleigh (Robert Taylor) wants to produce a show on Broadway. He finds a financial backer, Herman Whipple as well as a dancing leading lady, Sally Lee (Eleanor Powell). But Whipple’s scheming wife, Caroline, wants to force Steve to use a known star, not a newcomer. In a subplot, Sally (a former farm girl, who used to train horses on her parents’ farm before they lost everything in the Depression) purchases a horse and with two ex-vaudevillians, Sonny Ledford and Peter Trott (Buddy Ebsen), she trains it to win a race, providing the money Steve needs for his show. In short, Broadway Melody of 1938 is a very enjoyable musical, with good acting, an enjoyable romance, and great dancing by Eleanor Powell and Buddy Ebsen (a very young Buddy Ebsen, who I fondly remember as “Uncle Jed” from The Beverly Hillbillies — and this is a good example of how he began his career as a “hoofer”). There are lots of clownish comedy as well, with Buddy Ebsen “borrowing” feed for the horse from the mean-spirited Mrs. Whipple. Billy Gilbert as a Greek immigrant who becomes 1/3 owner of the horse. Whose singing nephew becomes crucial to the horse race as well. A young Judy Garland who sings Dear Mr. Gable (a modified version of You Made Me Love You), one of the highlights of the film. When young Eleanor Powell stepped in front of the movie camera for a little star turn in George White Scandals of 1935, no one could have accurately predicted she’d soon become a huge star, whose incomparable dancing skills made her an audience darling all over the world. Broadway Melody of 1936 instantly established Powell as a big-screen star. Here, she taps the spangled ebullience of Broadway Rhythm, while 15-year-old Judy Garland sings a smitten Dear Mr. Gable to a portrait of Hollywood’s King in Broadway Melody of 1938 and both actresses achieve career breakthroughs. In the Oscar ®-winning 1936 romp, Powell plays an Albany girl-next-door who poses as France’s and Broadway’s exotic La Belle Arlette. The 1938 tale has her portraying a horse trainer who’s just as much at ease in taps and tuxedo as she is in riding boots and jodhpurs. Judy steps lively, too, joining Buddy Ebsen for Everybody Sing. These star-making Melodies are merry musicals for every classic fan’s collection. For the number Your Broadway and Mine, the set is decorated with the names of Broadway stars from the 1910s and 1920s. When Alice (played by Sophie Tucker) starts talking about former times, Tucker’s name can be seen on at least all of the neon billboards before the number’s end. The song Dear Mr. Gable was a birthday present for Clark Gable’s 36th birthday. Composer and arranger Roger Edens adapted the old song “You Made Me Love You” by James V. Monaco. It was sung at Gable’s birthday party by a young Judy Garland. Producer Louis B. Mayer was so impressed by it, that he gave order to let Judy Garland sing it again in the next great musical MGM was going to produce. 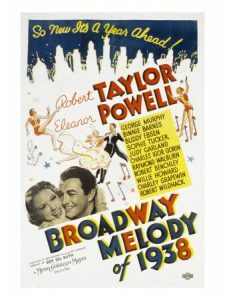 In the final number “Your Broadway and My Broadway” there’s a neon sign on the right with the writing “Broadway Melody of 1937” – the working title of this movie. The singing voice of Eleanor Powell was dubbed by Marjorie Lane. Prior to the finale, the show’s billboard is shown. There is a partially visible billboard to the right. It advertises the movie Personal Property which stars Robert Taylor who plays Stephan Raleigh in this movie. Preceded by The Broadway Melody and Broadway Melody of 1936. Followed by Broadway Melody of 1940. Another film in the series was planned, “Broadway Melody of 1943” starring Eleanor Powell, Gene Kelly, and Lena Horne. However, that project was abandoned, and the numbers that had been filmed for this project were placed into Thousands Cheer and Broadway Rhythm. and the beginning of the “Your Broadway and Mine” finale (sung by Garland and the MGM chorus). “Got a Pair of New Shoes” and “Sun Showers” were later sung by Garland in Thoroughbreds Don’t Cry, the latter being cut as well. Most of Powell’s tap solo to “Got a Pair of New Shoes” was included in the compilation film The Great Morgan.